Summary: This post shares 70+ ideas, tips, opinions and other resources about the value of innovation, inspiration, 'champions,' and importance of focus for marketing healthcare information technology products and services. As noted in my original post and previous posts, I've sifted through hundreds of tweets shared by attendees at last week’s Healthcare IT Marketing Conference event in Las Vegas. This is the 4th post presenting what I believe are useful bits of information for those charged with promoting healthcare IT products and services. Note: A lot of the information, ideas, resources and opinions presented below will be discussed during the #HITsm chat this Friday, April 14th, 2017 at 9:00 am PST where the theme will be Healthcare Content Creation for Audience Economy. "doing something stupid faster is NOT innovation." Reflexive #Innovation is habitual or reactionary while inflective innovation is strategic and impactful. Find a higher purpose for everything we do. Emotionally connect. Great keynote by Dr. Gary Rhodes..."You're not into doing. You need to inspire your customers because that's the future." Being exposed to people who get it & feeling less like I work on an island & more like I have access to a really awesome empire. Keynote #hitmc @professortalk Gary Rhoads - "You are in the inspiration business". Inspire people instead of compelling them. Great advice. The heart of every good story is emotion. @jpyjr Tell an interesting story. I was skeptical of value in FB Live before @mdeiner's session this morning - consider me now impressed and inspired. Thanks! Interactions with brands that leave customers feeling smarter inspires passion. How can you make sure this is true for your brand? Love that @jacirusso reminds us to forget demographics in favor of behaviors/emotions. What keeps your audience up at night? Let employee brand champions have a role in helping improve user capability/autonomy. Brand champions: no difference between employees and customers. 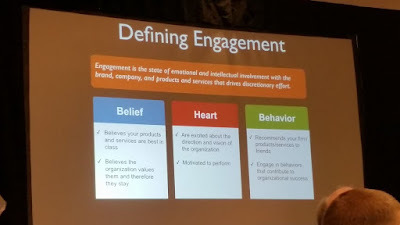 From Gary Rhoads: employees and customers are your brand champions. Engaged ones are passionate, happy, co-creators. Give your brand champions a BETTER reason to love us. Employers are in the inspiration biz. When we see momentum, we follow it. The future of management: INSPIRATION. Lead with passion if you want passionate employees who create great customer experiences. Through inspiration, we create passion. Are your #employees engaged & passionate? Ride the wave!! Follow the momentum & passion to define the future of your brand. Ask: Why are people passionate about your products and services? This will help improve engagement. Don't focus on the negatives, focus on the passion. Sounds like my parenting books. Where does passionate performance come from? "Communicate to the swing group through the eyes and heart of the love group." It's ok to go with suboptimal solutions if people are passionate about it. Let employees give workshops on their passions. Umm...anyone want to practice #triathlon transitions with me? To improve employee/customer engagement, find out how you can enhance passion by focusing on most engaged - & improve w/ disengaged. Creativity is best when we narrow our focus. I think everything is better when we focus. A focus on sales alone inevitably leads to fewer sales. When a company loses its soul, it inevitably loses its brand.